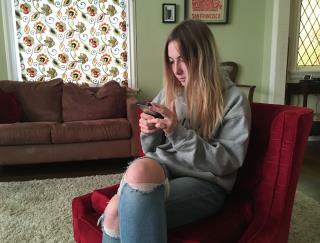 (Newser) – Rising suicide rates and depression in US teens and young adults have prompted researchers to ask a provocative question: Could the same devices that some people blame for contributing to tech-age angst also be used to detect it? The idea has sparked a race to develop apps that warn of impending mental health crises, the AP reports. Call it smartphone psychiatry or child psychology 2.0. Studies have linked heavy smartphone use with worsening teen mental health. But as teens scroll through Instagram and Snapchat, tap out texts or watch YouTube videos, they also leave digital footprints that might offer clues to their psychological well-being. Changes in typing speed, voice tone, word choice, and how often kids stay home could signal trouble, according to preliminary studies. Sure many different opinions on this topic but To begin with, a kid cannot give permission to be tracked or not, they are under 18, in addition, it’s not their property , it is the parents property and that being said the parents decided what access the phone has so parent permission is needed. Also it’s stated that those college age volunteers, who are being tracked for a base line are healthy individuals, well how was that proven, because they said so? Lastly use of this data if not covered under doctor client privacy laws could lead down a different path then intended. It always amazes when one hears of parents who track their kids on the phone when their out, very 1984ish indeed. Autonomy is part of growing up, their parents had it n survived. There must be another way. Perhaps they could just go outside and enjoy nature so they didn't have mental issues in the first place. Or they could work for a living.